Every time I see Sara Boggs around campus, like a giddy child, I ask her: “Can I see your sketchbook?” She always says “yes.” You see, Sara is one of those artists who constantly carries her handmade sketchbook around, capturing tiny moments of life here and there – taking the time to practice and develop her drawing ability everyday. It has been incredible to see her book grow with the faces, places, and the spirit of the Folk School during her host term this fall. She permitted me to scan in some pages from her book to share with you. We also sat down over cookies and tea to talk about her experience as host and artistic journaler. CP: You were recently a character in the night of Holiday Revelry hosted by David Vowell. Who did you play? SB: I got to play a couple of different characters: an all around reveler drinking wassail, the Little Pickle Boy in one of the tales about St. Nicholas, and Jack the Green in the mummer’s play. Jack’s character is traditionally full of mischief! In our play, Jack the Green saves the day in the story of St. George and the Dragon. CP: Very nice. So you are wrapping up your host term at the Folk School? What’s been your favorite part of being host? SB: It’s the people… it’s for sure the people. Every week, I get to meet all of these wonderful people with amazing stories and wonderful things that they have done. 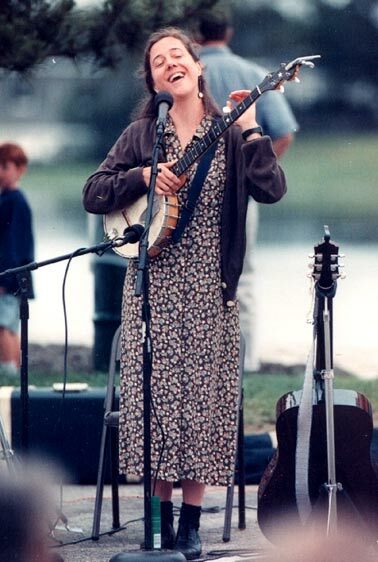 They are all so sweet and encouraging – they make me feel like this world we have here that’s not quite real life – this fairy tale world that’s all fiddle music and blacksmith coal – is something that we can carry always. It’s been really wonderful to meet them all. CP: Do you have any specific memories that resonate with you? SB: There have been quite a few. Maybe it was because it was so early on in my time here, but one that sticks out is a magical cooking class dinner party. The class was a wood fired cooking class and they had their Thursday night dinner outside on picnic tables, with candle light torches. There was wine, and ukelele music, and a beautiful pink sunset overhead… little dogs came wandering through. It was slow and delicious. I wasn’t even supposed to be there, I was just crashing, but they let me crash. It was a lovely evening and I felt like it was the right way to start off my foot here. 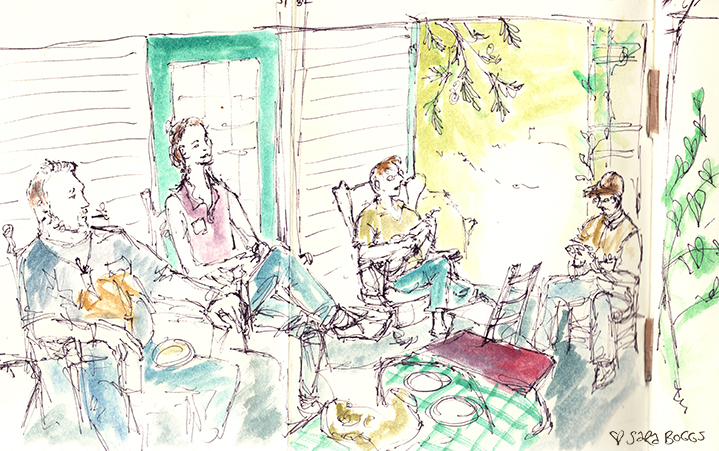 CP: You are really good at capturing the spirit of the Folk School through sketching. How you you decide what to draw? SB: No decisions. I just draw whatever is in front of me. CP: Do you always have your book with you at all times? And then just whip it out when you feel inspired? SB: I do. Or when I need inspiration! CP: Did you make your book? SB: I did. The cover is an old file folder that I got at a thrift store for pennies. It is bound with a plastic grocery bag. The interior is two sheets of etching paper which were fairly cheap, although I’ve found they don’t quite absorb the water the way I would like them to. 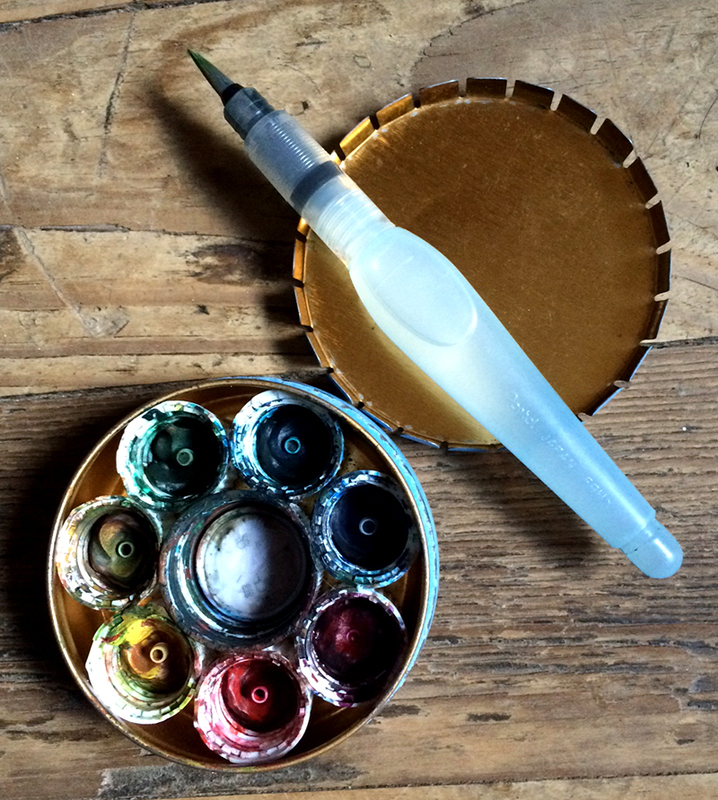 Sara’s water brush clever homemade watercolor tin made with recycled lids. CP: Why watercolor as opposed to pencils or markers? It seems like it might be a challenging medium to carry around. SB: It really isn’t because with colored pencils you have so many pieces. With watercolor, I just have my little watercolor kit and my water brush and that is it. 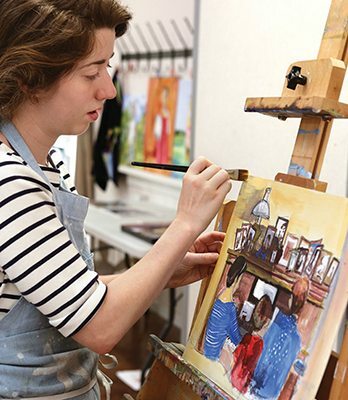 With watercolor, you are less restrained with color mixing. 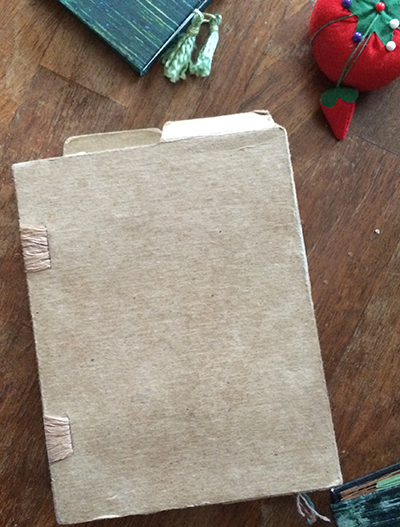 CP: Do you keep a journal like this all the time? or was this a special Folk School project? CP: How many do you have? SB: At least 20-30 and they just stay on the shelf and are used for reference for all sorts of things. 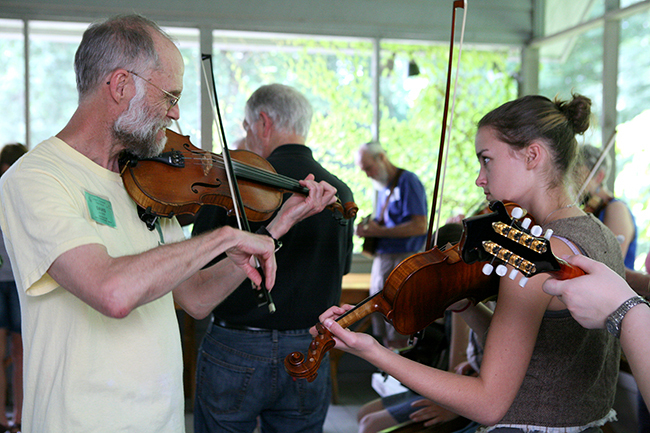 CP: What’s your favorite place at the Folk School? SB: It changes. In the fall when it was still warm weather, I loved that bridge back behind Mill House. It would be completely quiet and I could take my penny whistle and play and no one would listen, or if they did, they wouldn’t know who it was and you could watch the water go. When it got cooler and crisper and all the hay bales were out in the field, I found a place you could hide behind them. It was like you were in this wide open space that was entirely your own. It was wonderful for watching sunsets. If you stood on your head, they were twice is good. 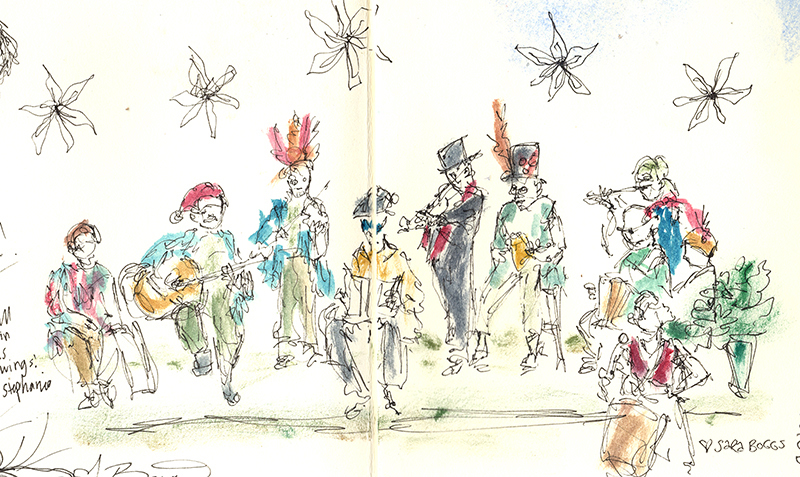 The Brasstown Morris Dance Band sketched by Sara Boggs. 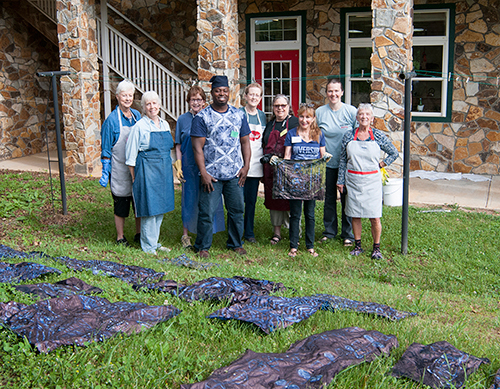 CP: What is your favorite thing you made at the Folk School? SB: I’m very proud of the little compost pot I made in Clay. 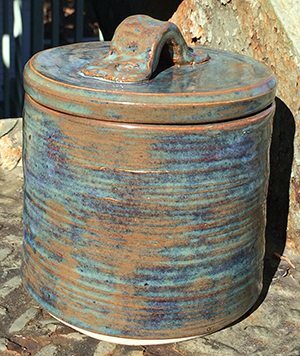 It’s the tallest pot I made and it’s going to be used on a daily basis which brings me great joy. CP: Where are you from? SB: Brevard, NC, but I grew up in Franklin. 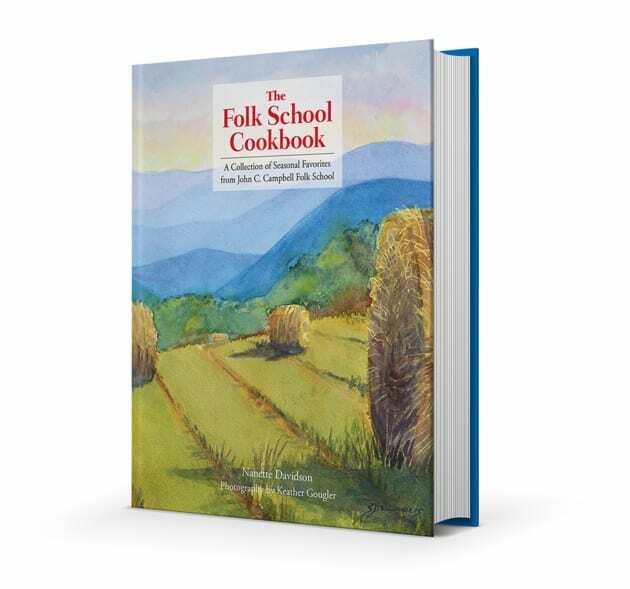 CP: Was the Folk School part of your life growing up? or did you find out about it as an adult? SB: I remember coming here on a school field trip and meeting David Brose. And possibly a Fall Festival or two. It was the catalog just being this presence in our home with all these creative possibilities. I’d dream about it, but didn’t think I’d be able to be a part of it. Now, I have been able to step into this fairy tale world and it’s everything that I hoped for. CP: How would you compare being a Host versus a Work/Study? 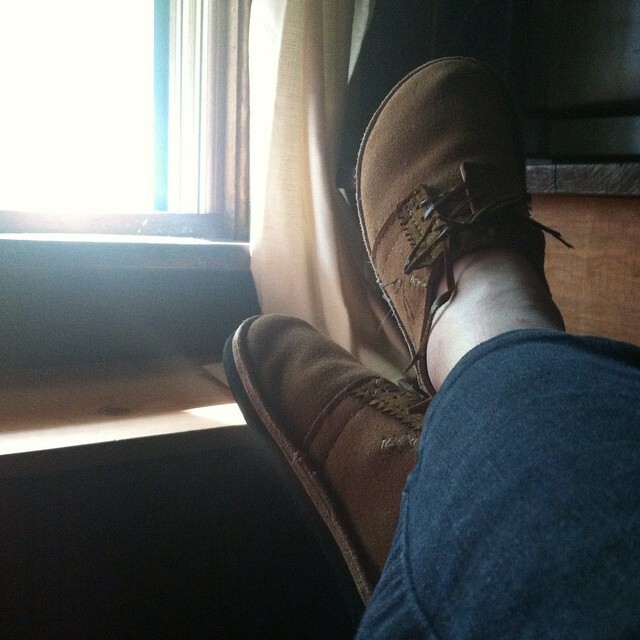 SB: Work/Study is more good hard physical labor, lots of fresh air and when you are done for the day, you are done, so you have lots of free time. With the host, there’s much more of an investment in people. You are here for a longer time, so you get to be more involved with the community. I like that part a lot… it makes my soul happy. 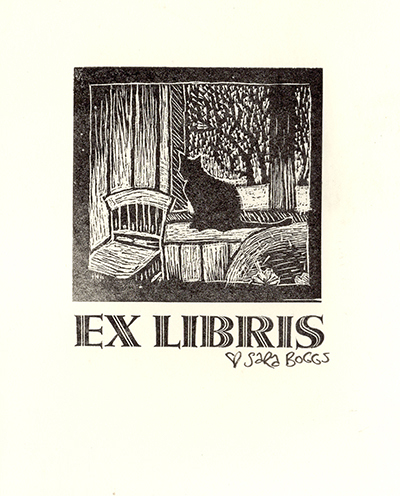 An etched book plate Sara created in Jim Horton’s Printmaking class. CP: Do you like to dance? SB: I do… I had never contra danced before I came here as a Work/Study and I’ve been addicted ever since. CP: My first memory of you is when we took Irish Set Dancing together. SB: At that point I had been to one contra dance ever and had never set danced ever! CP: But you did so good and that class was so fun. Would you take that class again? It’s coming up in March you know? SB: I think so, it would be fun to see how it feels now that I know the basics and have been dancing for a while. CP: Favorite meal in the Dining Hall? SB: I am very partial to soup days and I don’t know if it is because the soup or those big gorgeous bowls the soup comes out in. Soup day makes me happy. CP: A lot of those bowls are by Rob Withrow. Have you had the opportunity to make a face mug with him yet? 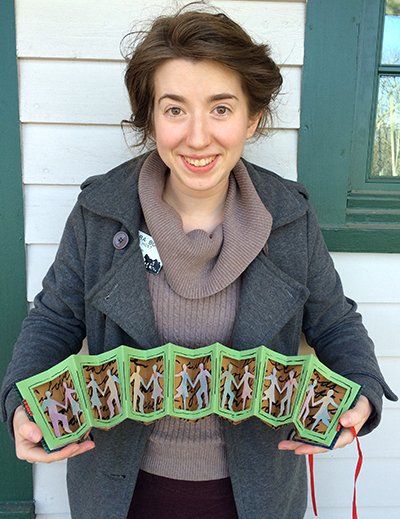 Sara holds the contra dance themed accordion book she made in Annie Cicale’s class. SB: I have! I’ve made two. One fell and broke his handle and the other has this most magnificent nose that makes it most impossible to drink out of. 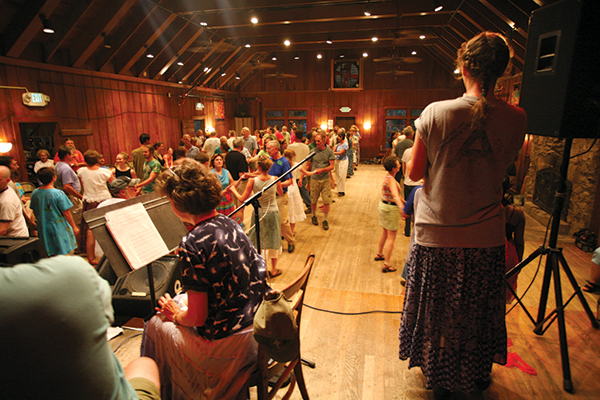 CP: If you were a contra dance move, what move would you be? CP: More the balance of the swing? SB: The moment right in the middle. CP: What are themes/motifs in your drawing? SB: When I was here as a Work/Study, I was unexpectedly interested by machinery. I liked to go down to the Blacksmith Shop to draw the way machines fit together. This time it’s the people, it’s loving catching expressions and who they are. CP: What were your “Silver Bullet” classes? One… I didn’t get a chance to write this on my evaluation sheet, but in my Blacksmithing class, there was me and (Work/Study) Hannah… and ladies and gents of all ages, but in that class it didn’t matter about gender or age… we were all blacksmiths that week. Huge props to John and Pete for making it that way. And then… I dunno… everyone has just been so good to me here and I really want to thank them for letting me be a part of everything. It’s been magical. 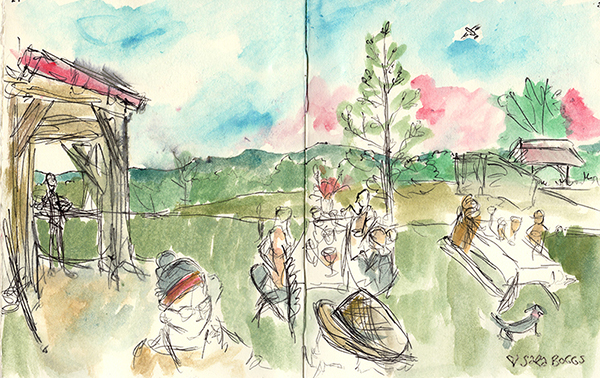 See more pages from Sara’s sketchbook on our Flickr page. Sara and I shared a work space in Annie’s Book Arts class…glue, brushes, weights, and “what do I do next?” But I think it was her artistry, imagination and creativity that spilled over to my side that I cherished the most that week. The contra dance book she created was a true representation of art in book form and I am so happy to see it pictured in the blog. You were a great partner in the Irish Set Dancing class and looked beautiful in your green dress on St. Pat’s Day. I will miss your smiling face and gentle ways. Thanks so much for sharing this with us – remarkable talent, remarkably portrayed. sweet Sarah was part of our knitting class and we loved every moment she was with us. Sara is amazing in every way!! I am so happy she is having this wonderful experience.